Written on September 26, 2017 . Posted in Announcements + Updates, Architecture and Design, Fine Arts, Liberal Arts. 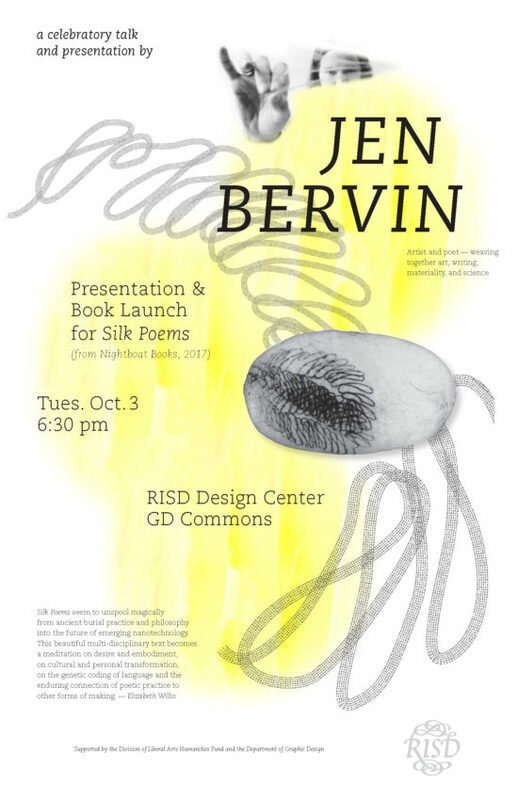 Artist and poet Jen Bervin will be on campus for the launch of her book, Silk Poems, on Tuesday, 3rd October 2017 at 6:30PM at the GD Commons, Design Center. The book is the final component of Jen’s Silk Poems project, conducted in conjunction with Tufts’ University’s Silk Lab. The project premiered at MASSMoCA in a yearlong exhibition and includes a short film Jen’s Bervin’s Silk Poems (Charlotte Lagarde 2016), which can be seen here. Jen Bervin has a longstanding relationship with RISD and Brown, especially RISD Glass, RISD Textiles, and Brown Literary Arts. This event is made possible by a partnership between the Department of Graphic Design and the Division of Liberal Arts Humanities Fund.